“I like Rabbit,” said Pooh. I’ve always been a big fan of A. A. Milne and his friends from the Hundred Acre Wood. 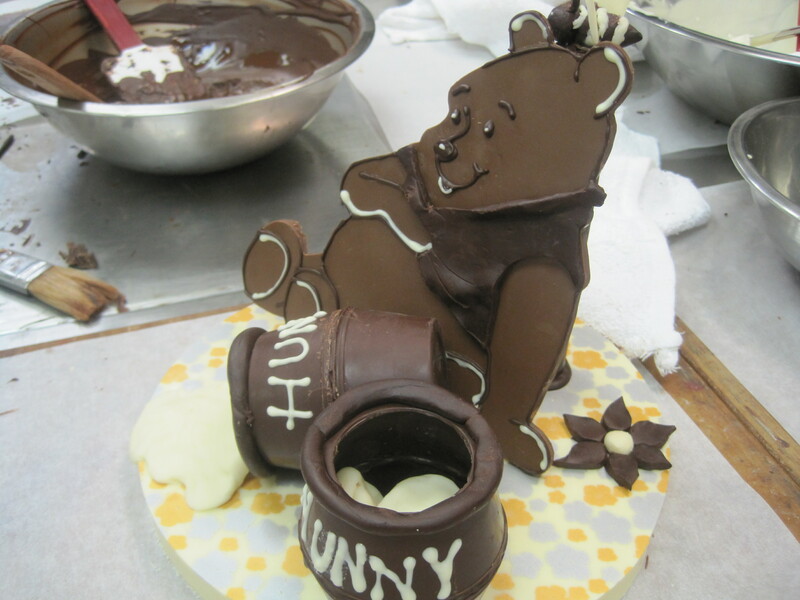 Eeyore, Piglet, Owl, Rabbit, Tigger, Kanga and Roo – and of course, the rumbly-tumbled Pooh Bear himself. And here he is! Isn’t he cute? So cute you could just eat him, I think. 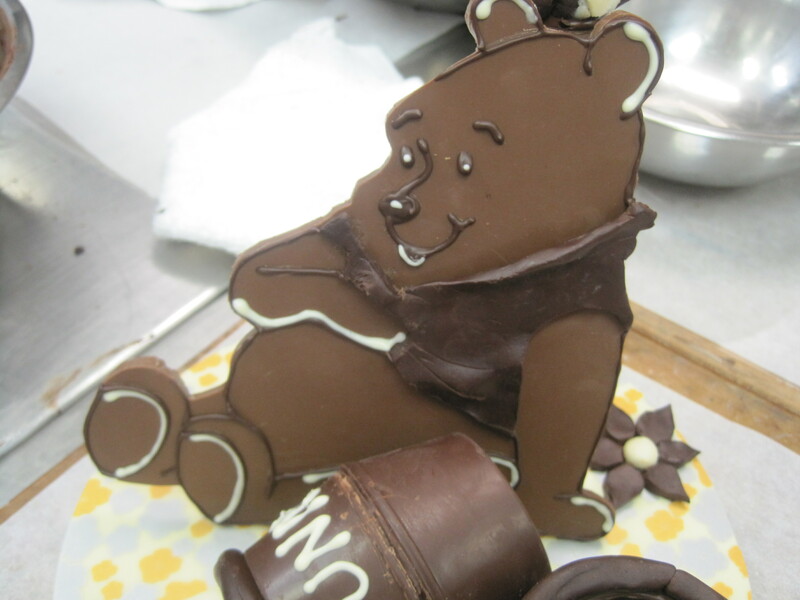 Yep, that’s our friend Winnie the Pooh, in chocolate form. 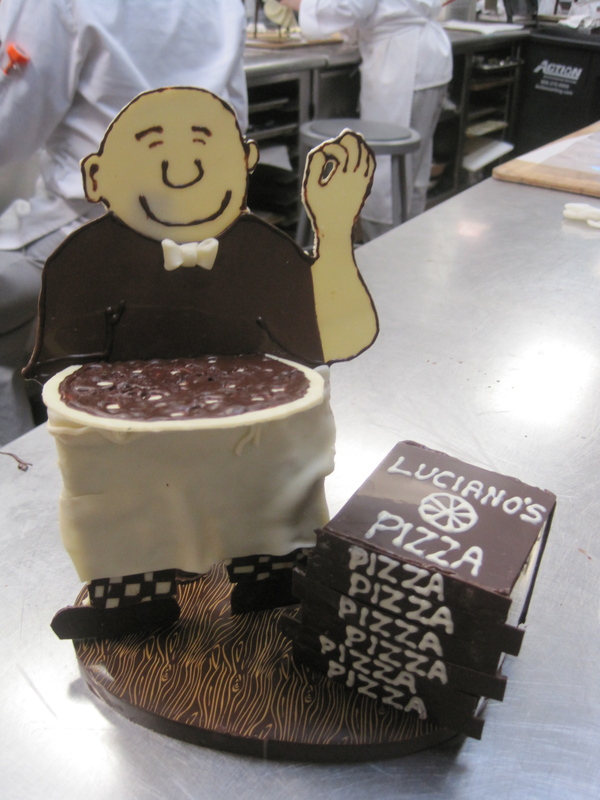 Entirely edible! 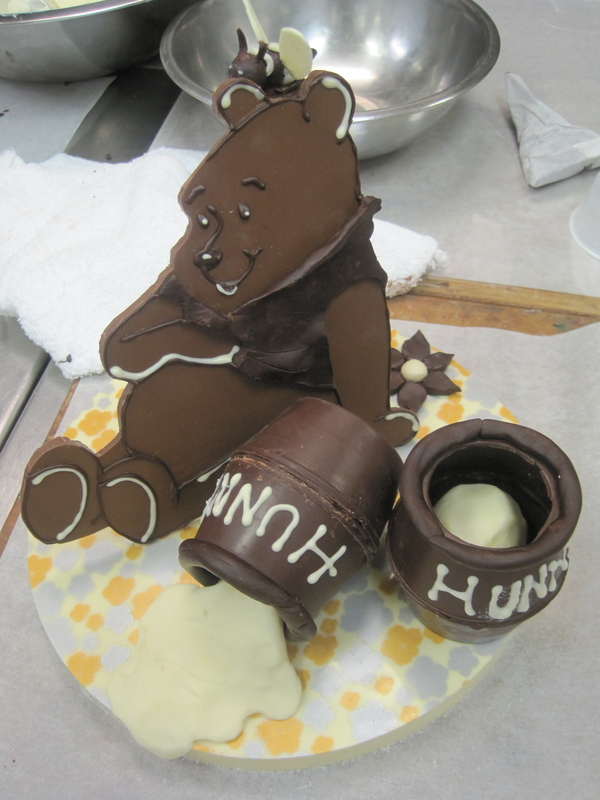 The base is white chocolate with a flower-patterned transfer sheet print, the hunny pots are molded dark chocolate, filled with white “chocolate plastic” hunny, and Pooh Bear himself is a creamy milk chocolate cutout. His shirt and the bumblebee on top of his head are also modeled from chocolate plastic. …Don’t worry, it’s not actually plastic – it’s made from sugar, water, corn syrup and melted chocolate – more like a very flexible tootsie roll. At any rate, it’s great for small decorations on chocolate showpieces. Like, say, for molding a silly old bear’s t-shirt. Or a bowtie and apron for the pizza man. Gahhh – don’t you just love chocolate? In the comments from my last post, someone asked if I have a recipe for homemade marshmallows. I like to use this one from Alton Brown. It makes a lot of marshmallows though, so you may want to cut it in half. You could flavor them simply with vanilla, as Alton suggests (listen, in my head we are on a first name basis, ok? Shut it. ), or you could throw in some cinnamon or use peppermint extract to spice them up a bit. Either way, enjoy these fluffy mallows with some hotta chocolatta! coming over now to eat pooh. So, forgetting about Winnie the Pooh and his hunny pot for a moment, how far will Wisconsin get in the Big Dance? And who will be left standing when the Dance ends? Oh, and do you have any suggestions for healthy snacks that we should be eating while feasting on college basketball for the next three weeks?